His insight into the challenges and complexities of managing the dynamic, complex, data-intensive process of health and safety compliance, and the importance of this process to protecting their employees’ health, was his impetus for the creating this technology. With input from industrial hygiene, safety, and OSHA compliance professionals, webOSCAR provides a comprehensive technology platform for businesses to efficiently manage health and safety as an essential business process. Key people are empowered by information and configurable workflow to make the business process more efficient and productive. The “opportunity cost” of not ensuring that health and safety is efficiently and reliably managed is injuries, lost productivity, and regulatory action. This unwanted risk is difficult and expensive to mitigate as a business grows and its needs or business environment changes. As Software-as-a-Service (SaaS), the cost of webOSCAR is a fraction of the amount of effort and resources most companies already spend on conducting and managing health and safety compliance. 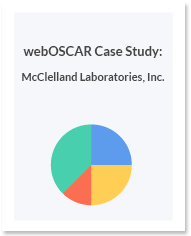 webOSCAR pays for itself by saving valuable time, reducing compliance vulnerability, and freeing up resources that allow your business managers to focus on core business priorities. Companies and organizations of all sizes, with single or multiple facilities, use webOSCAR every day to execute health and safety compliance as an essential part of their business process.